Your front door and your back door are very important aspects of your home security. It is critical that you keep them as secure as possible. It’s something you may not have given a lot of thought, but there are many things to consider concerning door security. That is, if you wish to reduce the chances of someone breaking into your home. In order to maintain a safe and secure door, you must first understand the risks they pose and ways in which you can avoid them. We recommend a complete home security risk assessment to get some idea of the level of protection your home has. It is also a good idea to anticipate the threats you home might be vulnerable to. 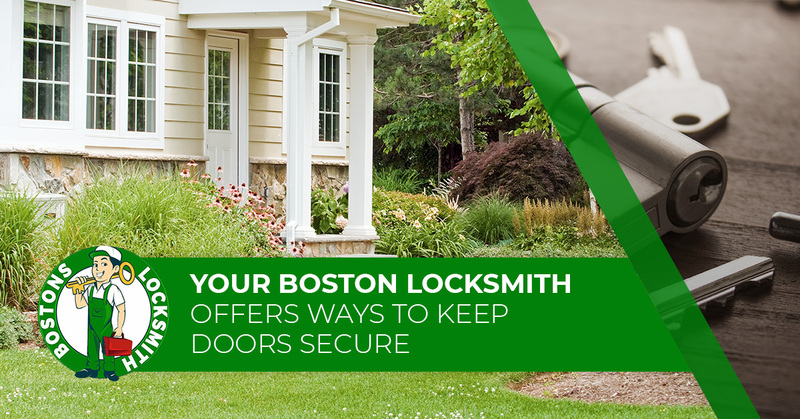 Bostons Locksmith offers these things to consider when thinking about the best ways to keep your doors secure. If your front or back door has a deadbolt, cutting the pock is a popular way to break in. If your home has a cheap deadbolt from a sketchy website or retail store, cutting through it might be quite easy, even for a novice. Unfortunately, cutting through a cheap lock is quite easy and can be done in very little time with a hacksaw. Do your research, spend the extra money and buy a quality deadbolt that is tough to cut. It will give you peace of mind. Many people think that many thieves pick locks to gain entry. This is just not the case. Older locks are fairly easy to pick, so if your locks are old, your chances of getting picked are higher. Newer locks are much harder to pick, so most thieves opt for other ways to try to break in. There are many ways thieves can gain access through a door, using a drill on the lock is quite common. This is an effective way to break a lock because drills are easy to obtain and you don’t have to be a lock expert to drill one open. A quality lock will be hard to drill and will only lead to a frustrated and unhappy thief. This method of breaking into a home is popular. Kicking a ramming are violent methods of breaking into a home and can be used by just about anyone. Kicking a door in is popular, but thieves also use their shoulders to strike the door. Some even use battering rams or other devices. If your door or lock is flawed, it takes very little effort to bypass a secure door. There are many ways in which a door can be bypassed including using a credit card to release the lock. What you need to do is study the ways doors can be bypassed and work at making sure your doors are secure from these threats. To protect your property and family from burglary or home invasions, you may need to update the locks on your home. Along with having new door locks installed, you should call Bostons Locksmith to assess your window locks as well.